Just like last year I am planning to fill my Christmas break with wall to wall craft time. Last year was a huge success that culminated in the addition of the owl embroidery floss organizer to my product line. I have several projects up my sleeve and was hoping that you would help me prioritize them. Latch Hook rug Vintage. New in Package. And I already have the tool! Punch Needle embroidery: I purchased PlanetJune’s punch needle embroidery e-book and Moon pattern ages ago. I finally found a punch needle, so I’d like to give it a try. Crochet blanket I want to add a least a few hexagons to this languishing crochet project. Spinning My apartment is full of fiber. 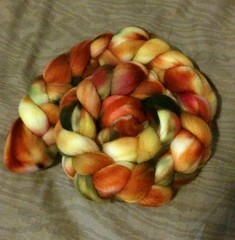 I would like to convert some of it into yarn. Needlework pattern Just like last year I still have some vintage crewel patterns that I would like to stitch up. Now I also have an Amy Sedaris cross stitch pattern (from Lauren at Sweet-meats) and a few recently procured Japanese cross stitch patterns to try out. Marshmallows I like to make homemade marshmallows. Last year I experimented with some homemade marshmallows with bourbon in them, and I would like to perfect the recipe this year. 2 Responses to "Christmas Craft Marathon"
How do I vote for the punch needle moon (or is the voting closed because the holidays have already started)? Ok, so what did you end up doing? C\’mon, I didn\’t get to craft much at all over the break – I gotta get a fix! 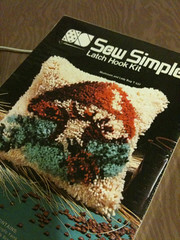 Plus, the punchneedle deal looks super fun. Hope you\’re doing well!